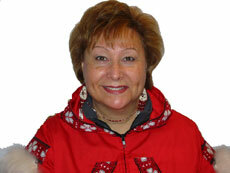 Patricia Cochran, BS, is an Inupiaq Eskimo born and raised in Nome , Alaska . Ms. Cochran serves as Executive Director of the Alaska Native Science Commission (ANSC), a non-profit organization created to bring together research and science in partnership with Alaska Native communities. ANSC serves as a clearinghouse for proposed research, an information base for ongoing and past research and an archive for significant research involving the Native community. ANSC provides information, referral and networking services for researchers and Alaska Native communities. Ms. Cochran has served as Chair of the American Indian/Alaska Native/Native Hawaiian Caucus of the American Public Health Association; Science Advisor to the Arctic Research Commission; Member of the Alaska Global Planning Team, Member of the Science Steering committee for the National Science Foundation Human Dimension of the Arctic System; Advisory Committee Member for NSF Office of Polar Programs; Program Chair for the Indigenous Program of the International Congress on Circumpolar Health; Treasurer and Governing Council Member of the International Union for Circumpolar Health; Member of the National Native Science Education Advisory Council; Member of the National Research Council Committee on Managing Wolf and Bear Populations in Alaska and Committee on Cumulative Environmental Effects of Alaskan North Slope Oil and Gas Activities; Board Member of the American Society for Circumpolar Health, President of the Albrecht-Milan Foundation, Board President of the Abused Women’s Aid in Crisis center; Member of the Southcentral Native Educators’ Association; Steering Committee Member of the Northern Research Forum, Working Group Member of ICARP II (International Conference on Arctic Research Planning), Board Member of Native American Cancer Research, Program Steering Committee Member of the NIH Native American Cancer Research Partnership, Advisory Panel Vice Chair for the North Pacific Research Board, President of Spirit Days Incorporated, and U.S. lead for the Youth and Elders Initiative of the Arctic Council.